Take the oranges and cut away the orange part of the skin. You can leave the white pith on, or not, depending on how much you like the taste of it. Drop the peeled oranges into a high-speed blender (if you don't have a VitaMix, make sure you remove any orange seeds). Toss in a few handfuls of cashews (start off with just a little, and add more as needed to obtain pudding consistency), agave or dates, salt, and vanilla bean. Blend until smooth (if it's too watery, add more cashews--too firm, add another orange). Scoop the pudding out and chill for half an hour (if you can wait that long!). This is a super easy dish that is extremely delicous. 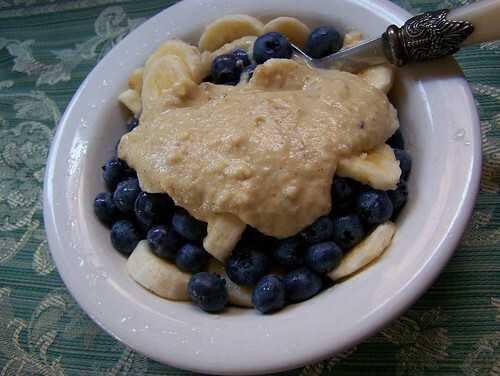 I've made it in the past and served it over fresh blueberries and bananas (I called it orange creme at that time). Yum! If you don't have enough cashews (that was my case), or you don't like to consume a lot of them, add dried raw coconut flakes as a thickener! That's what I did and it was even more amazing than with just the cashews in it! It tasted a lot more tropical and fresh! looks good i emailed it to my mom have any recipies with whole wheat elbow pasta ? Destiny, You will LOVE this orange pudding because I know you love fruit so much! As for the whole wheat pasta, I don't eat pasta. However, since you love sweet bell peppers, a good topping would be lightly stir-fried bell peppers (or raw, if you like them that way!) with some garlic, olive oil, salt, and maybe some Italian seasonings. Ooh! And a few fresh tomatoes would be good, too! Experiment until you like the taste of what you are creating and then write it down! You'll be your own personal chef if you keep trying new things on your own!